That’s my new fashion mantra for this winter, folks. Trying to love the one I’m with, so to speak. And I’m not talking about Hubby here. I’m trying to rekindle the love I once felt for some of the older pieces in my wardrobe. I’ve been complaining that my closet is so edited it’s become a bit boring. And I’m on the hunt for some pieces to take me in a new direction, add some interest, maybe change up my preferred silhouette. Give me something to build on. I love having a goal. I am nothing if not patient with a long term plan. Where’s the challenge in instant gratification? But in the meantime I need to keep boredom at bay. Take the other day, for instance. I was off downtown, to Mountain Equipment Co-op in Westboro, to finish up my Christmas shopping. Hubby needs a new fleece. And I thought I’d stop into a couple of my favourite small independent stores in the area. We’d had a big snowfall the previous day, and it was cold out. And windy. Temperatures would soar to a whopping -15 C by late afternoon. Richmond Road would be cold, and messy with salt and snow. I’d need to be wrapped up. So here’s what I wore. My Vince black wool leggings over my ski underwear. Heavy socks and my freshly waterproofed Stuart Weitzman boots. I unearthed from my drawer this cream wool turtleneck from Gap. Bought back in December 2014 when I was, coincidentally, shopping for Hubby’s Christmas present, I think I paid only $30.00 for it. I had a coupon from Gap in my purse, and a niche in my wardrobe for just such a sweater. 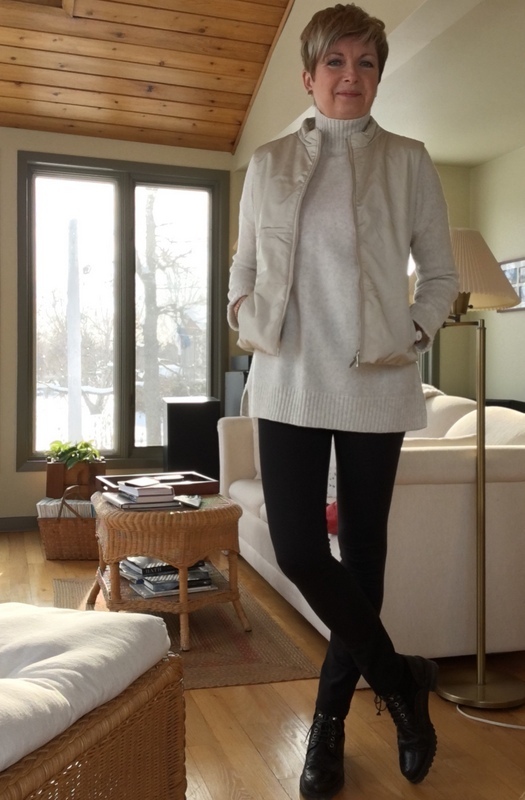 I also hauled out from my storage box under the bed in our spare room, this cream puffy vest from Max Mara. You know, I bought this vest way, way back in 2002. I used to wear it with a long, cream-coloured, corduroy midi-skirt, and boots. The skirt has long gone, and it wouldn’t fit if I still owned it. I love the vest with this sweater. I’m a fan of black and cream. And the vest, although it doesn’t add colour to the outfit, does add interest. Partly because of its shape and length, but also because of the shiny texture.This outfit is just snazzy enough for me for a day of winter shopping. In fact, I may take this on our ski holiday in January. Although most of Hubby’s and my apres-ski time is spent in the condo, lolling around the fire with a book, I could wear this to dinner at the lodge. Or for driving into town to have a look round the shops when it’s too cold to ski. We’ll see. Christmas shopping in cream and black, times three. 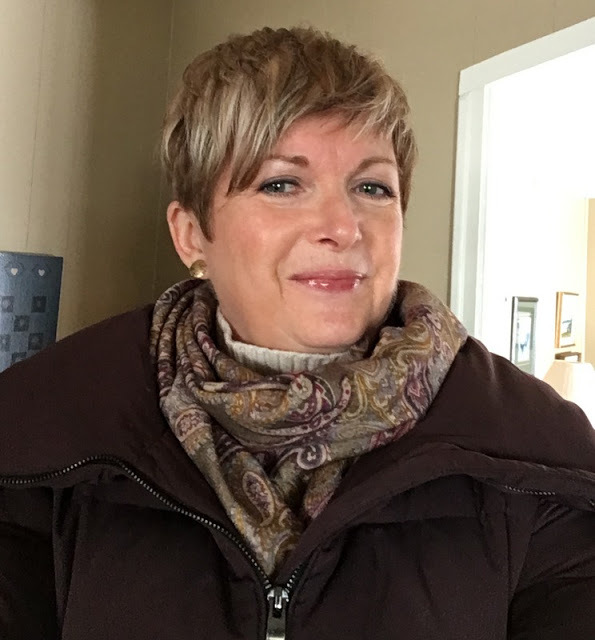 I added my burgundy and beige scarf, my burgundy down coat, and suitable layered up, I was off. And I must tell you that my shopping day in Westboro was very successful. I found a couple of great things for Hubby at Mountain Equipment Co-op. A fleece jacket for one. But also a great book about wild edibles that I think he’ll love. MEC has all kinds of cool things besides outdoor sporting equipment and clothing. I always find something interesting… camping mugs, hand warmers for skiing. It’s one of the few places where Hubby and I have actually shopped together. There’s nothing like shopping for his and her ski underwear to cement a relationship, I always say. Ha. After I left MEC I wandered into Green Tree Eco Fashion… now known as Canopy. The lovely Mary was working. I get such a kick out of that girl. She really knows her stuff. We always yak the whole time I’m there. I love a chatty sales person. She asked me if I was in a hurry, and I wasn’t, so she pulled a ton of things off the rack for me to try. Something to wear with what I already own to my Christmas party tonight? Yep. Maybe something a little different to wear with my leather pants? Yep. Then I tried on a few pairs of culottes, and some wide-legged pants, and even found a style that I think might work. So I left with a couple of new pieces, and a few new ideas. Can’t ask for more than that, eh? I’ll tell you about the new pieces, and the new ideas, soon. All bundled up in my down coat for old-fashioned shopping. You know, I love to shop in the small neighbourhood stores anytime of year, but especially around Christmas. It’s old-fashioned Christmas shopping. Reminds me of that Christmas song … “Silver Bells”… you know… “city sidewalks, busy sidewalks, dressed in holiday style…” Besides, there’s just something about hot shopping malls, and crowded food courts, lugging your coat around because it’s too hot to wear, watching exhausted parents juggling parcels and strollers, or collapsed on benches in the middle of the mall that is a bit, well, soul destroying. I know that’s hyperbole. But I’d rather slither along a snowy sidewalk braving the winter winds than face the traffic jam getting out of the mall. But back to my point. It’s good to focus on loving the one we’re with, so to speak. Pulling old pieces out of the closet and seeing how we can rekindle our interest in them. Especially if we can’t find anything new to love. And speaking of the one I’m with, Hubby says to say that he particularly likes that cream and black outfit. Not that he actually gets a say in what I wear… let’s be honest here… still, it’s nice to have the spousal vote of confidence every once in a while. Now, I’d better go do my work-out, then make a final decision on what I’m wearing tonight. It’s our big hockey gang Christmas party. There will be lots of food and drink. Lots of laughs. And singing. Followed by more laughter. Ha. And speaking of singing… I can’t resist Dean Martin singing “Silver Bells.” How I loved him when I was a kid. Me and Mum.. we’re big fans. How about you, my friends? Do you have to work on loving the one you’re with? With respect to your closet, of course. PrevPrevious storyWhat Are You Obsessed With Right Now? I have a special fondness for Neil Young too. Even more so since he's Canadian. And I love the song…"Love the One You're With." What a pleasant post for a Saturday morning! You reminded me to get out two similar zipped waistcoats/gilets that have been sitting in the wardrobe for years and which are perfect right now. One dark brown leather, the other pale suede. Will enjoy having a try-on later and they will come in very handy for a late-January trip to extremely cold Poland that is all booked. Black and cream – always good. An air of refined luxury. I shall enjoy Dean. Have fun at the party. I will. Hope the vest/gilet trying on goes well. Lovely outfit , it has a luxurious look & it’s a great feeling to pull out something out of your store that looks good . I’ve got in mind a black silk Devore velvet tunic top from some 20 years ago , for Xmas day . Not quite as roomy as it was but better for that . I’ve not heard that song before but can’t help warming to Dean’s voice & it takes me back to childhood . I have such a soft spot for Dean Martin… from my childhood as well. I laughed when you said "dogs to chat with" and remembered your chatting with a couple of dogs that day in Bakewell. Lately, I've been working a bit too hard to come up with new outfit combinations from my closet. As we approach the winter solstice, I find I now just want to wear what's comfy and familiar. Yesterday, for example, after struggling to assemble a "Christmasy" ensemble for a holiday luncheon, I said, "Screw it!" and threw on black jeans, black turtleneck and black boots with a black/grey/red blazer (which is much quieter than that description sounds like). Again and again I come to appreciate how useful it is to know MY personal style so that I can feel comfortable in my own skin (almost literally). Trying to conform to dress codes, even those that aren't enforced, can evoke anxiety I don't need or want. BTW, your own personal style seems to fit you quite well. I have frequently said that as well… who cares…I'm just going to be comfortable. Not old sweats and a baggy sweater kind of comfort… but pulling on familiar pieces that I've worn often because I know they look good and I feel good in them. I love this combination! You look great. I have a wool belted jacket that is from 2000 or even later. I love pulling that out. I will be wearing a top that is about 3 years old for a holiday get together tonight and am making it work. Our Gap is closing along with our Teavana and I agree with the mall shopping scenario. Did you know the Mall of America is not heated? People and lights keep it plenty hot. May have to visit some local shops today. Happy Saturday! Thanks, Christa. The only good thing about mall shopping is that you only have to park the car once. And since the independent stores I like are too far apart to walk between them, this is sometimes the best way to shop around if time is a priority. But I much prefer the uniqueness of the small stores. Love that sweater…it looks so great with your black skinny pants/leggings. So many parties at this time of year…good for you to be proactive and work out despite the cold weather. I love cream on cream! I wear a similar outfit…old navy cream vest and a cream turtleneck….usually with jeans. Listening to Dean Martin brings back wonderful memories…i can hear my father singing along! Ooohh that sounds promising. Good sales people are worth their weight in gold. Sometimes I despair that big retailers don't appreciate the good people they employ. Thanks, Brenda. I know I should probably embrace colour or more dramatic accessories… but that's just not me. I love your outfit! One of my goals this winter is to try new ways to wear the older items in my closet that haven't seen the light of day in awhile. I'd heard that you were getting brutally cold weather and lots of snow. We, on the other hand, have been having unusually warm temperatures for the past few weeks and have hardly any snow left! It's been quite bizarre, but I'm not complaining. I'm not a fan of cold. Love your cream and black outfit. Just perfect. Your one cool looking lady. Happy Holidays. Ah… thanks, Sandra. Happy holidays to you too. 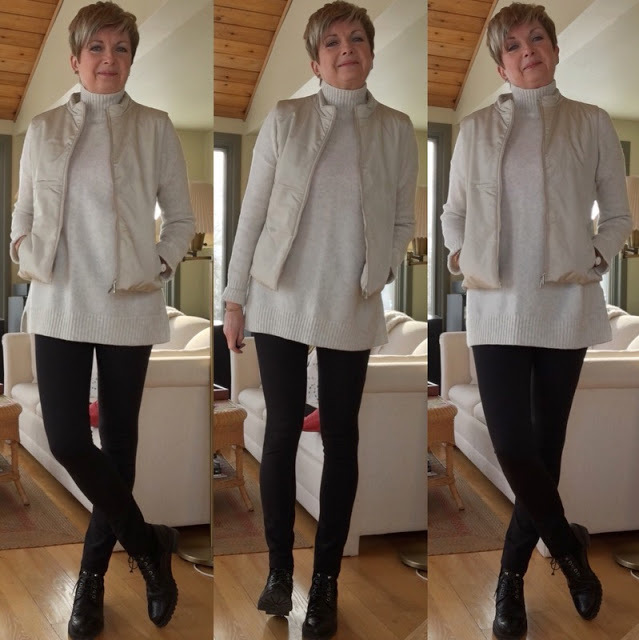 You look great in cream and black … a completely "new" outfit from clothes already in your wardrobe.I love it when that happens and items work as well in practice as they do in my head! Please keep posting snowy pics on instagram. It's lovely to see your view of the river and surrounding areas where you ski, covered in snow! I keep thinking that people must get tired of my view of he river season in and season out. We had a lovely evening. And no fuzzy head the day after:) Hope you and your family have a lovely Christmas. I have always admired your style and I'm loving seeing more of it today! The black and creme is elegant on you and I am so glad you brought those pieces out to wear more. Looking forward to future fashion posts. You look very elegant and cozy to brave the cold temperatures. Love this combo and isn't it great when you can pull out something from your closet that looks so good? Merry Xmas and wishing you a happy and healthy 2018 with more of your thought provoking and fashion posts. Thanks, Christy. Merry Christmas to you too. well you look quite lovely and stylish. thanks for sharing – found you on Visible Mondays. I've loved layering a vest this time of year. Thanks for sharing all the ways you're finding to look great! A book on wild edibles! What a great idea! Totally stealing your idea there- thanks!